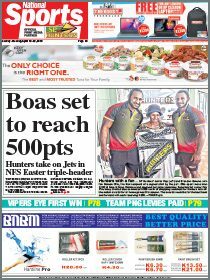 PETTYSHEN Elijah’s two goals helped Port Moresby team one beat Lower Sogeri team two 3-0 in the opening round of the Southern Region Besta FA Cup yesterday at the Bisini soccer grounds. The David Passam-coached team looked sharp throughout the game keeping the Koiari men scoreless. Port Moresby’s Eka Philemon was the first to score in the 7th minute to give his side a 1-0 lead at halftime. Elijah added two more goals and they looked comfortable however Elijah, a National Soccer League player and national representative, thought they could have scored more goals if they did not waste several chances. “I think the game was okay, but it’s our first one and we have seen where to improve for our next game but we also need to improve our defence,” Elijah said. “Even though we won, we lost a lot of balls and we didn’t make use of our opportunities and in our next game I hope we polish up on those areas. Elijah, whose side is in Pool C, was wary of such opponents as Hoods team 2 and Karekodobu team 2, who will be looking to top the pool and earn a spot in the finals. 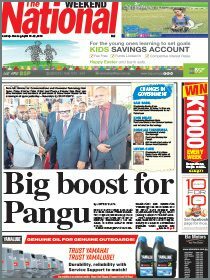 “The teams from the Central province are really good and they’ve shown it in the recent Under-17 football tournament and also at the Port Moresby Soccer Association’s Premier League through Keleiruna,” he said. Tournament director Leslie Babaga said the tournament would have its finals either on Sunday or Monday depending on the scheduling of the games.